Our Panda bears are always popular and so if you like Kou Hin, let us know soon. 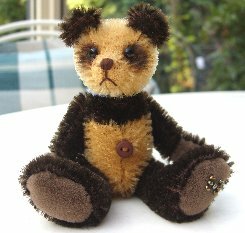 He is 3 1/2" tall and is made of two shades of brown, light golden mohair, short and sparse, combined with very dark velvety soft mohair, both are German. His pad and paws are mid brown cashmere, he has dark brown painted panda markings, shiny black German glass eyes and a dark brown stitched nose. We have filled him with steel shot so he is nice and heavy for his size. Whilst Kou Hin is not the traditional black and white, he is still a very sweet panda with a lovely upturned nose and a bright enquiring expression, I hope that you like him. Kou Hin costs £39 plus postage. Please note that as with all our bears, Kou Hin is not a toy and is not suitable for children. Sorry - Kou Hin has been adopted.